You can find Memphis recordings in the strangest of places. Here's Marjorie Ingram for example. The label Bennett was Huntington, NY based and is best known in deep soul circles for the wonderful Kenny B release which was certainly cut in the Big Apple. But this one was recorded down in Tennessee by writer/producer Dan Greer. I Have No Right To Love You is a typical southern ballad with that fantastic big horn section blaring out behind Marjorie's gutsy vocal. And that must be Greer doing the background vocals surely. Note George Jackson's name on the writer credits for the bouncy and engaging flip. "One artist Dan and George [Jackson] worked with who was to have important consequences for Dan was Marjorie Ingram. “We recorded several things but we never got round to putting them out. Marjorie started working with some other people. 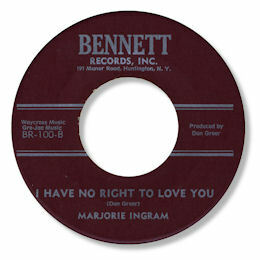 We didn’t have any contracts on these people, we were just doing something with them because we had worked with them.” One Marjorie Ingram 45 did get a release, however, as ‘I Have No Right To Love You’ c/w ‘A Good Man Is So Hard To Find’ found its way to Bennett Records, a New York company and that deal eventually led to Dan beginning his solo career. (He is still in contact with Marjorie and hopes to eventually record a cd with her.) Dan went on to explain the significance of the deal on Marjorie Ingram with Bennett Records. “I started on a project with Bennett and we did the things on Marjorie. So after that I started working on some things for myself and that’s when I came up with the song, ‘Curiosity Killed The Cat’. That was my first national solo release after the two local ones. I had been working with Eugene Bennett in New York..."
NEW UPDATE ~ William Brown writes to say that "the Marjorie Ingram single "A Good Man Is Hard to Find"/"I Have No Right to Love You" (Bennett BR-100) was also pressed by Columbia Records' custom division; the matrix number on the former side was designated ZTSP 144965 while the latter was ZTSP 144966. (The label shown in your piece on the record was printed by Progressive Label Co. of Brooklyn, NY.)" I'm grateful to William Brown for getting in touch. I'm grateful as always to David Cole, and to Colin Dilnot, for the extra info.